If you keep up with the children’s book world then you already know that everyone’s talking about this book. It’s received glowing reviews from all the major players (read a few here, here and here), readers and it’s getting lots of award buzz. There’s even talk of making it into a movie. So of course I had to read it. Actually, I listened to it as I usually do with middle grade novels. Let’s face it, sometimes it can be a real chore to slog through a book meant for 10-year-olds. It’s narrated by Bronson Pinchot. For the most part I enjoyed his voice but there were a couple of characters whose voicing really grated on me, i.e. Chintzy. Balki from Perfect Strangers, remember him? Micah believes in the stories his dying Grandpa Ephraim tells him of the magical Circus Mirandus: the invisible tiger guarding the gates, the beautiful flying birdwoman, and the magician more powerful than any other—the Man Who Bends Light. Finally, Grandpa Ephraim offers proof. The Circus is real. And the Lightbender owes Ephraim a miracle. With his friend Jenny Mendoza in tow, Micah sets out to find the Circus and the man he believes will save his grandfather. This is an interesting premise which sounds promising. It’s supposed to be a book which “celebrates seeing magic in the world”. The writing is solid, a vivid description here, a nice turn of phrase there. 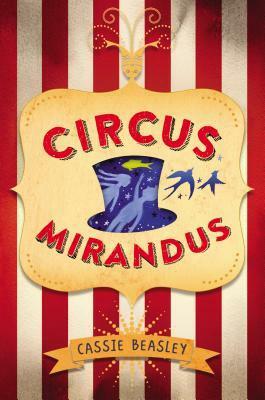 However, for a book about powerful magicians and a magical circus I expected more fantasy, whimsy but instead it felt pedestrian to me, clunky. I was underwhelmed. That might have to do with the complete lack of character development. We’re given very little about the main characters and the character with the most backstory, Micah’s mother, is only talked about in bits of flashback and the climax of her story ends abruptly. All the other characters seem flat. Or it might be a result of the jumps between Circus Mirandus and the real world which happen suddenly and at odd times. Maybe I was underwhelmed because the magic doesn’t seem all that….well, magical. Grandpa’s talent for knot tying plays all through the book and is touted as being magical, but I didn’t get it. I see kids being confused by the ending. What really happened–a grim reality or magic? That’s for other readers to decide. Maybe they’ll enjoy this circus more than I did.